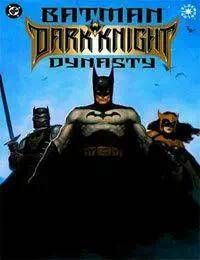 BATMAN: DARK KNIGHT DYNASTY presents a story that uses the Batman mythos as a foundation but includes dynamic interpretations and plot twists to create a truly unique experience. This century-spanning epic introduces the reader to three different Dark Knights from the 14 century to the year 2500. The original Batman is a holy knight named Joshua Wainwright. During the Crusades, Wainwright takes on the guise of a bat and becomes the sworn enemy of the villainous immortal Vandal Savage. As the tale continues after Wainwrights demise, his descendants take the mantle of the bat and dedicate their lives to battling the undying Savage.